Respect to them that they don’t give up. I think they’ve been around as long as this forum has. Perhaps with changes coming to the way the rail network is run with the franchise system falling out of favour; this could be their moment. Exciting. I really hope they can make it happen. Bristol City Council will find a way to operate it with buses instead. Yup. A company wanted to do something similar in Bath and that like many other things got thrown out. We are very backward about going forward in this part of the world. Further proof that the current set up is not fit for purpose and hasn’t been for a long time. I would have thought that a Castle Class HST would be ideal for the Summer extra Bristol to Weymouth. Was that why you were asking Graham? What a difference a few days make. Hasn't stopped raining in this part of the world since 6pm yesterday. I'm sure I've seen it at one or two underground stations too. Possibly on the eastern part of the Jubilee line. The line has reopened between Exeter St Davids and Castle Cary following a river flooding the railway earlier this morning. Train services running through these stations may still be disrupted so please check your journey before travelling. Due to a river flooding the railway between Castle Cary and Exeter St Davids all lines are blocked. Train services running through these stations may be cancelled, delayed by up to 30 minutes or diverted. Some stations between Taunton and Exeter St Davids will not be served. Disruption is expected until 10:00 06/03. If you wish to use local buses as an alternative means of transport and the local bus is not accepting Great Western Railway tickets, please keep the bus ticket and send it, together with your rail ticket, to us for a refund. Replacement road transport is in operation in both directions between Taunton and Exeter St. Davids. Due to heavy rain flooding the railway between Exeter St Davids and Yeovil Junction all lines are closed. Train services running through these stations have been cancelled. Disruption is expected until 10:00 06/03. Our control centre has been informed that heavy rain has caused the railway to flood between Exeter St Davids and Yeovil Junction. Due to the level of flood water, it is not currently safe for us to run our trains through the affected area. We are NOT able to offer ticket acceptance on GWR services, as their line is closed for tunnel repair work, so they are using our West of England line. This means that there are currently no trains travelling between Exeter St Davids and Yeovil Junction. Trains are able to run from Yeovil Junction to Salisbury directly or via Westbury. Very limited road transport has been arranged to call at all stations between Exeter St Davids and Yeovil Junction in both directions, calling at all stations. Please note that this transport will not run to a fixed timetable. If you need help in completing your journey, please speak to a member of station staff, use a station help point or visit southwesternrailway.com. We are very sorry for the delay that this will cause to your journey. If you would prefer to use local buses to continue your journey please check Traveline (http://www.traveline.info/) - South Western Railway tickets are not valid on local buses unless stated above. It will also make life easier for anyone travelling between Temple Meads and Bath, Chippenham, Swindon etc, or indeed boarding at those stations for London. Indeed, it certainly will have a positive effect on the current two services an hour that go via Bath that there will be less Bristol passengers who are London bound as they will probably use the non-stop after Parkway services to London. 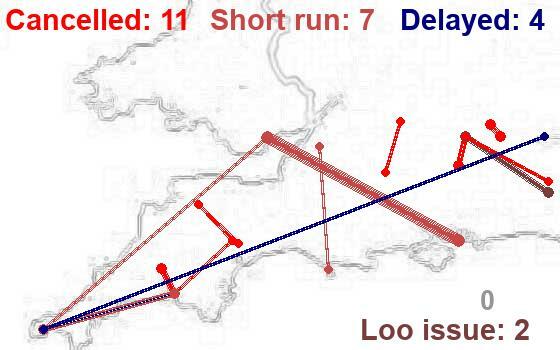 I just think that with the large volume of London traffic that Bath Spa generates, a third fast service would be useful but for the capacity constraints through Bath, something Parkway no longer has an issue with with four tracks and the faster line via Badminton. Maybe, but as GWR are saying nothing about the forthcoming major timetable changes and for those of us unable to attend such timetable meetings, your reply is very much appreciated Graham. One can but hope in time that GWR will be more forthcoming publicly with the timetable changes once they've been agreed by Network Rail. Commenting on the four trains an hour Bristol-London. Are four trains an hour really needed, especially from Parkway? I would have thought one of those could have gone via Bath then non-stop to London. But I am aware of capacity constraints between Bristol and Bathampton Junction is probably the reason why the extra two services an hour will go via Parkway. I do wonder, mind you, if 3 more 80x units were already in use on those services how many other services would be 5 carriages instead of 10. Was never going to be an ideal solution having two separate trains with no walk through. If only there had been some spare 158’s to strengthen the existing GWR fleet operating the route but alas there isn’t.